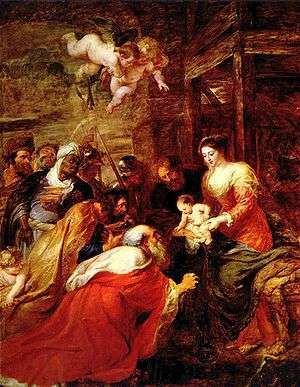 The Adoration of the Magi (1634) by Peter Paul Rubens, which hangs behind the altar in King's College Chapel, Cambridge. In 1878 the Royal Cornwall Gazette reported that the choir of Truro Cathedral would sing a service of carols at 10:00 p.m. on Christmas Eve. The Choir of the Cathedral will sing a number of carols in the Cathedral on Christmas Eve, the service commencing at 10pm. We understand that this is at the wish of many of the leading parishioners and others. A like service has been instituted in other cathedral and large towns, and has been much appreciated. It is the intention of the choir to no longer continue the custom of singing carols at the residences of members of the congregation. Two years later, Edward Benson, later Archbishop of Canterbury but at that time Bishop of Truro, in Cornwall, formalised the service with Nine Lessons for use on Christmas Eve (24 December) 1880. The first service took place at 10:00 p.m. on Christmas Eve in the temporary wooden structure serving as his cathedral whilst the new cathedral was being built. Over 400 people attended this first service. There is an oft-repeated myth that the purpose of the service was to keep men out of the pubs. The service has subsequently been in continuous use (with modifications) in Truro since 1880, and followed Bishop Benson in his new appointment as Archbishop of Canterbury in 1883. In December 2013 Truro Cathedral staged a reconstruction of Bishop Benson's original 1880 Nine Lessons with Carols Service which was attended by an audience of over 1,500 people. The best-known version is broadcast annually from King's College, Cambridge, on Christmas Eve. It features carols sung by the famous Choir of King's College. Groton School of Groton, Massachusetts, has performed the festival longer than any institution other than King's, holding its first Lessons and Carols in 1928. King's College Chapel, photographed on 16 November 2006. The first Festival of Nine Lessons and Carols at King's College, Cambridge, was held on Christmas Eve in 1918. It was introduced by Eric Milner-White, the Dean of the College, whose experience as an army chaplain had led him to believe that more imaginative worship was needed by the Church of England. The order of service was adapted from the order created by Benson for Truro Cathedral 38 years earlier, which was based on an idea of George Walpole, at the time Succentor of Truro Cathedral, and the future Bishop of Edinburgh. The first service at King's largely followed Benson's original plan, including the Benedictions before each reading, several of which were later amalgamated by Milner-White into his Bidding Prayer. The music at the first service at King's was directed by Arthur Henry Mann, who was the organist from 1876 to 1929. The choir had 16 trebles as specified in statutes laid down by Henry VI, and until 1927 the men's voices were provided by choral scholars and lay clerks. Today, 14 undergraduates from the Choir of King's College, Cambridge, sing the men's parts. The service was first broadcast by the British Broadcasting Corporation in 1928 and, except for 1930, has been broadcast every year since. During the 1930s the BBC began broadcasting the service on its overseas programmes. Even throughout the Second World War, despite the stained glass having been removed from the Chapel and the lack of heating, the broadcasts continued. For security reasons, the name "King's" was not mentioned during wartime broadcasts. Since the Second World War, it has been estimated that each year there are millions of listeners worldwide who listen to the service live on the BBC World Service. Domestically, the service is broadcast live on BBC Radio 4, and a recorded broadcast is made on Christmas Day on BBC Radio 3. In the USA the broadcast has been heard live on public radio stations affiliated with American Public Media since 1979, and most stations broadcast a repeat on Christmas Day. Since 1963, the service has been periodically filmed for television broadcast in the UK. Presently, each year a programme entitled Carols from King's is pre-recorded in early or mid-December then shown on Christmas Eve in the UK on BBC Two and BBC Four. The programme is weighted more heavily in favour of carols sung by the choir, with only seven readings in total, not all of which are from the Bible. The format of the first Festival of Nine Lessons and Carols did not differ substantially from the one known at King's College, Cambridge today. The order of the lessons was revised in 1919, and since that time the service has always begun with the hymn "Once in Royal David's City". These days the first verse is sung unaccompanied by a solo boy chorister. To avoid putting him under undue stress, the chorister is not told that he will be singing the solo until immediately before the service is to begin. The Nine Lessons, which are the same every year, are read by representatives of the college and of the City of Cambridge from the 1611 Authorized King James Version of the Bible. The singing is divided into "carols" which are sung by the Choir of King's College, Cambridge, and "hymns" sung by the Choir and congregation. Some services have also included anthems between the carols and hymns, such as a performance of "E'en So, Lord Jesus, Quickly Come" in 2004. Since 1982 the current Director of Music, Stephen Cleobury, has commissioned a new carol each year on behalf of the College for the Choir. The carols vary from year to year, although some music is repeated. The service ends with the hymn "Hark! The Herald Angels Sing". The following is from the service in 2008. Processional Hymn: "Once in Royal David's City" – words by Cecil Frances Humphreys Alexander; melody by H.J. Gauntlett, harmonized by H.J. Gauntlett and A.H. Mann; descant by Stephen Cleobury. 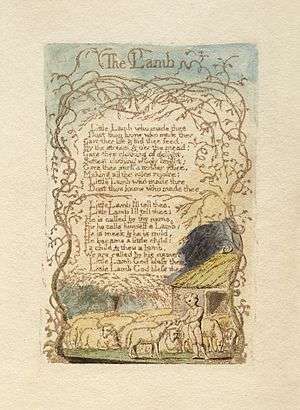 The fourth lesson employed John Tavener's choral arrangement "The Lamb" of William Blake's The Lamb from Blake's collection' Songs of Innocence and of Experience. This image represents copy C, object 8 of that original poem, currently held by the Library of Congress. The poem was published during 1794 and hand painted by Blake and his wife. 1985 Illuminare Jerusalem Words: adapted from the Bannatyne manuscript in John MacQueen; Winifred MacQueen (1972), A Choice of Scottish Verse, 1470–1570, London: Faber and Faber, ISBN 0-571-09532-1 . The Festival of Nine Lessons and Carols held on Christmas Eve at King's College Chapel is primarily intended for the City of Cambridge and members of the general public. There are about 650 seats in the Chapel for the service, most of which are in the Ante-Chapel; seats in the Choir are largely reserved for College members and their guests. The demand for seats always exceeds the number available. Members of the public are admitted to the College through the main gate on King's Parade from 7:30 am (though some start queueing the night before), and each person is given an information leaflet which must be retained and shown to the duty porter for re-entry if he or she desires to leave the queue temporarily. People joining the queue before 9:00 am will usually gain admission to the Chapel, but this is not guaranteed. Porters monitor the number of people joining the queue, and once there are as many people as there are seats available, the others are advised that it is unlikely they will be able to attend the service. Members of Collegium Regale (the Choral Scholars of King's College Choir) usually sing Christmas carols to entertain the people who are queueing. A limited number of seats are available for people unable to queue due to disability or illness. Application for such seats must be made by 31 October to the personal assistant of the Dean of King's College. The doors of the Chapel are opened at 1:30 pm and the public allowed to find their seats. As the service is broadcast live by BBC Radio 4, at the request of the BBC it begins a little after 3:00 pm and not exactly on the hour due to an hourly radio news update. It concludes at around 4:30 pm or 4:45 pm at the earliest. The Choir of Groton School, of Groton, Massachusetts, USA, has been presenting a Festival of Nine Lessons and Carols since 1928, ten years after the service was introduced at King's. 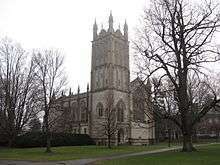 Groton holds the distinction of having the oldest tenured Lessons and Carols service in the United States. The school's first organist and choirmaster, Twining Lynes, is believed to have heard the service at King's, and shortly thereafter began the tradition with his choir at Groton. Since its inception, only seven organists have presided over the Groton service. Beginning in 2014, the choir has been conducted by Dan Moriarty. The choir performs the service three times to an overall crowd of over 2,000 people. The first service is open to the residents of Groton, MA and the surrounding towns, the second service is for parents and alumni, and the last service is done for the students and faculty and is broadcast live on Groton's website. The service at Groton consists of an orchestra prelude, and then nine lessons read by students, faculty, and members of the community. Interspersed throughout the lessons are a number of hymns and songs sung by the Choir. The oldest service in an American parish church is at Saint Thomas in Hanover, New Hampshire, where the Festival of Nine Lessons and Carols has been presented annually since 1935. Diane Meredith Belcher has been the Music Director (Organist & Choirmaster) at Saint Thomas since 2014; the children's choir is directed by Sarah Slater. ↑ "Christmas at the Cathedral". Royal Cornwall Gazette. Falmouth. 20 December 1878. Retrieved 18 August 2015. ↑ "Festival of Nine Lessons and Carols". bbc.co.uk. 16 December 2005. ↑ Alex Webb (24 December 2001), Choir that sings to the world, BBC News . 1 2 3 4 5 Nine lessons and carols: History of the service, King's College Chapel, retrieved 2008-03-09 . ↑ History of A Festival of Nine Lessons and Carols, King's College, Cambridge, retrieved 2010-12-25 . ↑ Peter Kingston (21 December 2007), "The world's greatest carol event", The Guardian (EducationGuardian) . ↑ "A Festival of Nine Lessons and Carols 2004". Kings College, Cambridge. University of Cambridge. Retrieved 3 November 2014. 1 2 A Festival of Nine Lessons and Carols, Christmas Eve, 2008 (PDF), Provost and Fellows of King's College, Cambridge, 24 December 2008, retrieved 2008-12-25 . 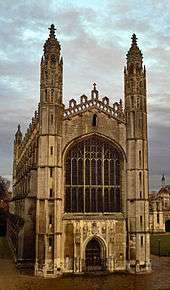 For the songs sung in earlier years, see "List of carols performed at the Festival of Nine Lessons and Carols at King's College Chapel, Cambridge". 1 2 Nine Lessons and Carols 2001, Provost and Fellows of King's College, Cambridge, 2001, retrieved 2008-01-01 . 1 2 3 A Festival of Nine Lessons and Carols, Christmas Eve, 2005 (PDF), Provost and Fellows of King's College, Cambridge, 24 December 2005, retrieved 2008-01-01 . 1 2 3 4 A Festival of Nine Lessons and Carols, Christmas Eve, 2007 (PDF), Provost and Fellows of King's College, Cambridge, 24 December 2007, retrieved 2007-12-24 . ↑ Nine Lessons and Carols 1997, Provost and Fellows of King's College, Cambridge, 1997, retrieved 2008-01-01 . ↑ Nine Lessons and Carols 1998, Provost and Fellows of King's College, Cambridge, 1998, retrieved 2008-01-01 . ↑ Nine Lessons and Carols 1999, Provost and Fellows of King's College, Cambridge, 1999, retrieved 2008-01-01 . ↑ Nine Lessons and Carols 2000, Provost and Fellows of King's College, Cambridge, 2000, retrieved 2008-01-01 . ↑ Nine Lessons and Carols 2002, Provost and Fellows of King's College, Cambridge, 2002, retrieved 2008-01-01 . ↑ Nine Lessons and Carols 2003, King's College Chapel, Cambridge, 2003, retrieved 2008-01-01 . ↑ Nine Lessons and Carols 2004, Provost and Fellows of King's College, Cambridge, 2004, retrieved 2008-01-01 . ↑ In addition, a carol entitled Starry Night O'er Bethlehem with words by Anne Willcocks and music by David Willcocks was also specially written for the service. 1 2 A Festival of Nine Lessons and Carols, Christmas Eve, 2006 (PDF), Provost and Fellows of King's College, Cambridge, 24 December 2006, retrieved 2008-01-01 . ↑ OUP Choral News E-mail October 2009, 9 October 2009 . ↑ Oxford Music Now (PDF) (33), Oxford University Press, Spring 2009, p. 5, retrieved 16 May 2009 . ↑ Boosey & Hawkes - Performance Calendar, retrieved 24 October 2010 . ↑ A Festival of Nine Lessons & Carols, Order of Service, 2011 (PDF), retrieved 25 December 2011 . ↑ A Festival of Nine Lessons & Carols, Order of Service, 2012 (PDF), retrieved 27 December 2012 . ↑ Commissioned carol sets Blake poem to music, retrieved 5 December 2013 . ↑ Richard Causton composes 2015 commissioned carol, retrieved 29 November 2015 . ↑ Michael Berkeley composes Christmas commissioned carol, retrieved 19 November 2016 . 1 2 3 4 5 6 Nine Lessons and Carols, King's College Chapel, retrieved 2008-03-10 . 1 2 The Festival of Nine Lessons and Carols, King's College, Cambridge [information leaflet], King's College, Cambridge, 24 December 2007 . ↑ See, for instance, Neil Hallows (22 December 2006), Queuing for King's, BBC News . Cleobury, Stephen (December 1988), "Nine Lessons and Carols at King's: 70 Years On", The Musical Times, The Musical Times, Vol. 129, No. 1750, 129 (1750): 687 & 689, doi:10.2307/966672, JSTOR 966672 . Barnett, Laura (9 December 2006), "My week: Stephen Cleobury", The Daily Telegraph (Weekend) . Wikimedia Commons has media related to Nine Lessons and Carols.